The fleet tanker BAYLEAF sailed from her berth at Loch Striven on Monday morning, and moved upriver to spend some time on the Baron's Point degaussing range. 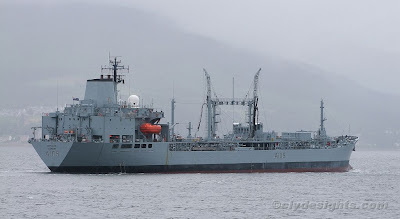 The Royal Fleet Auxilairy ship had spent several weeks at the Loch Striven fuel jetty following her recent refit at Cammell Laird on the Mersey, and around a week ago had spent a day steaming around the lower Clyde estuary. After a number of passes over the degaussing range, BAYLEAF set sail from the Clyde.